The iconic horsebit loafer leaves its mark once again, this time in warm weather colors and fabrics. Gucci horsebit loafer 60th anniversary inside tag. 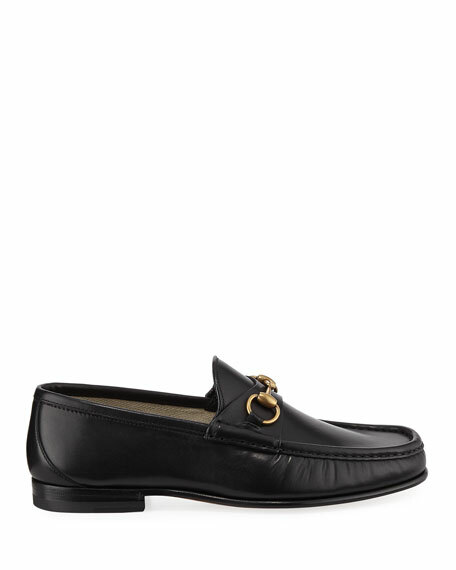 Gucci "Donnie" leather loafer. Elongated apron toe. Notched vamp with signature web and Double-G hardware. Leather lining and sole. 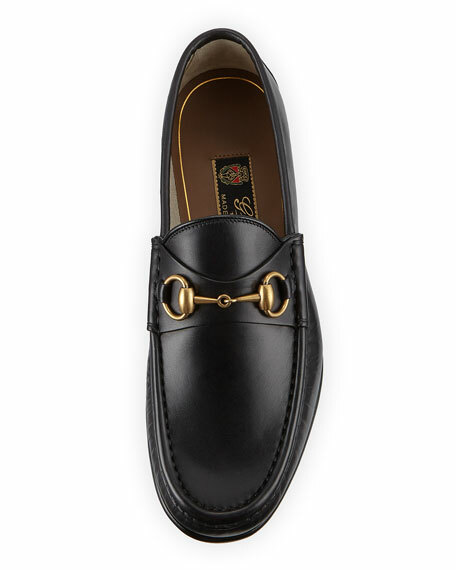 1"
Gucci "Donnie" leather loafer. Elongated apron toe. Notched vamp with signature web and Double-G hardware. Leather lining and sole. 1" stacked heel. Slip-on style. Made in Italy. 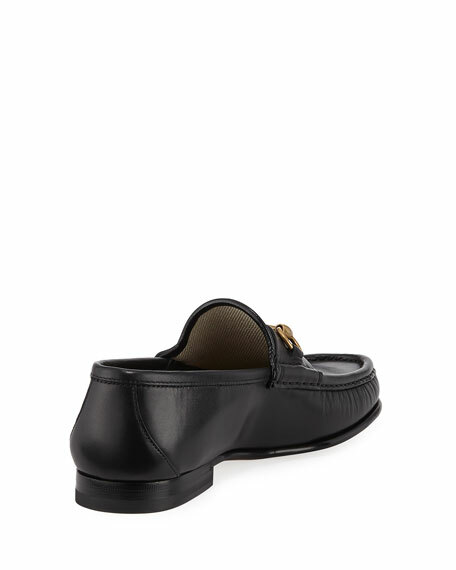 Gucci fold-down loafer in velvet with leather trim. Embroidered New York Yankees#174; NY logo patch at top, used with permission of Major League Baseball Properties, Inc. Grosgrain piping. Leather heel counter. Quilted lining. Leather sole. 1.0" heel height. Made in Italy. Gucci leather ankle boot with leather bee detail at the back. Heel, 0.5"H; shaft, approx. 4"H. Loafer-style vamp with horsebit. Gucci leather ankle boot with leather bee detail at the back. Heel, 0.5"H; shaft, approx. 4"H. Loafer-style vamp with horsebit. Rosebuds print lining and sole. Rubber lug sole. Slip-on style. Made in Italy.